While growing up, there were a handful of times that my parents picked me up from school and said they had a surprise in store for us. My first thought was always "Disneyland!" Sadly, it never was. Mike and I noted that to get the third and final use out of our three day Park Hopper Disneyland Passports, we had to use them yesterday. Knowing that the boys will miss a bit of school when we transition from the U.S. to Macau, we don't really want to pull them out of school unless absolutely necessary. So we did the next best thing and picked them up from school and drove 30 minutes to Anaheim and the Magic Kingdom to use our passes one last time before they expired. On a school night no less! Lines were short and we just dashed on and off all the favorites. After a year of begging, Nathan finally accompanied me on the Indiana Jones ride, only to have it break down right at the scene where Indy is dangling from a rope while the giant ball comes plunging towards the Jeep... Let's just say it was very anticlimactic when we managed to "survive". There were two big highlights. First of all, both boys are in love with Big Thunder Mountain Railway, the fast runaway train. Even when the line is super short, it still takes quite awhile to go through the queue to get back on the ride. After our first time around, I shouted "I wish they'd just let us go a second time without getting off!" As we pulled into the station, the cast member remarked over the loudspeaker that if we wanted to go a second time, all we had to do was stay seated! It was just perfect. The second highlight (for me alone) was when the evening drew to a close, our little guy Ben snuggled up in my arms and fell fast asleep. I treasure this because Ben was the baby who only ever wanted his bed, never to be rocked to sleep. He would let you hold him, but he'd look longingly at his crib the whole time. 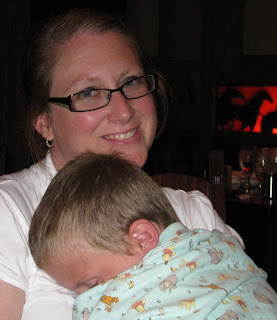 So to fall asleep in my arms at age five is a huge gift for me. absolutely beautiful picture... you must frame it! WOW - You guys ARE the Coolest parents ever!!! And how cool that they let you ride 2x in a row and that such a great day would have such a perfect ending!!! So sweet... glad you're feeling better!